Sub: CSE-Mid Day Meal Scheme - Automated Monitoring System introduced by GOI - certain instructions issued. The attention of the all the RJDSEs and DEOs is invited to the references read above, and they are informed that the GOI introduced Automated Monitoring System for real time monitoring of Mid Day Meal Scheme in the reference cited. 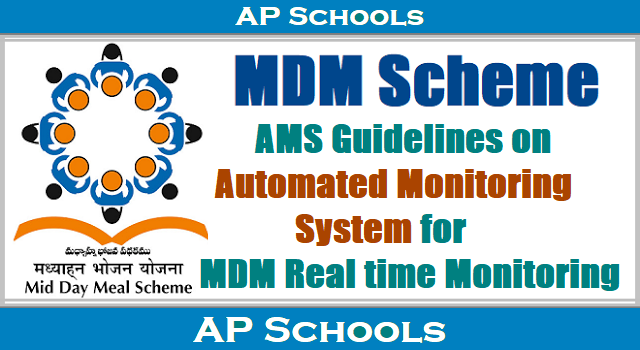 In this connection they are requested to see that the HMs of all the schools should upload attendance of MDM Scheme through App and SMS already developed for the same by the NIC / APONLINE. This data will be forwarded to AMS by state head quarters. The following guidelines arc given below for taking necessary action. 1. The enrollment should be updated within stipulated time at school level in SIMS. 2. The data in App/SMS should be uploaded immediately after the completion of serving of meals.The server will be closed by 6.00 PM. 3. All the schools in their respective districts should report the attendance of the MDM through App/SMS within stipulated time. 4. Necessary action will be initiated against the defaulters in this regard. Hence all the RMS. and DEC. are requested to issue necessary instruction in this regard to all the HM/MEOs/Dy.E.Os to make successful uploading of data i.e., 100% in App/SMS to forward the same to GOl Automated Monitoring System as the 53.36% data was uploaded on 25.07.2017.